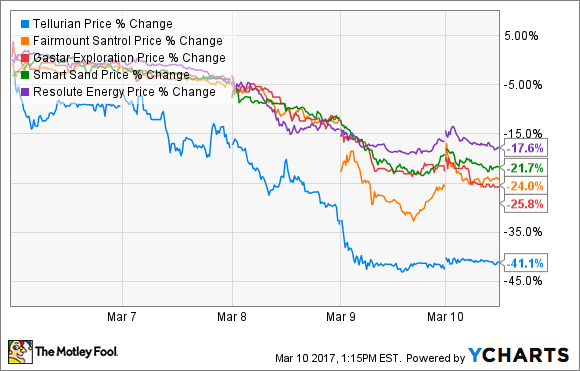 A sell-off in the oil market, as well as other factors, sent Tellurian, Fairmount Santrol Holdings, Gastar Exploration, Smart Sand, and Resolute Energy crashing this week. After several weeks of relative calm, crude prices sold off sharply this week. Overall, crude was down more than 8%, closing below $50 a barrel for the first time since November. Fueling the sell-off was an 8.2 million barrel increase in oil stockpiles, which hit a record 528.4 million barrels thanks to rising U.S. oil production. Those sinking oil prices caused most oil and gas stocks to sell off this week. However, some fared worse than others due in part to poorly received company-specific news. Leading the decline, according to data from S&P Global Market Intelligence, were Tellurian (NASDAQ:TELL), Fairmount Santrol Holdings (NYSE:FMSA), Gastar Exploration (NYSEMKT:GST), Smart Sand (NASDAQ:SND), and Resolute Energy (NYSE:REN). TELL Price data by YCharts. LNG infrastructure developer Tellurian sold off sharply this week, despite its Driftwood LNG project recently receiving State Department authorization to export LNG to free trade agreement nations. The company hopes to start construction of that project next year, which would put it on pace to deliver first LNG in 2022. It appears that this week's sell-off is just the market handing back the stock's recent gains after it jumped 50% last month. Investors seem to be coming to their senses that this company needs a lot of time and money before Driftwood will start to generate cash flow. Fairmount Santrol Holdings crashed this week after reporting fourth-quarter results that disappointed the market. That's despite the fact that the company met expectations and didn't say anything different than what its frack sand-producing peers had already stated about the market, which is that volumes are up but that prices haven't yet followed. The company's sell-off caused other frack sand producers, including Smart Sand, to plunge this week. Another factor fueling this week's frack sand stock sell-off is slumping crude prices. That's because sub-$50 crude could cause drillers to slow down drilling activities, which would hurt volume growth for sand producers and keep a lid on prices. Meanwhile, Gastar Exploration slumped after reporting fourth-quarter results. The company's financial performance was in line with expectations of an adjusted loss of $7.5 million, or $0.06 per share. However, what seemed to bother investors was the company's guidance for 2017. Overall, Gastar sees production averaging between 5,200 to 5,400 barrels of oil equivalent per day (BOE/d) in the first quarter and 5,500 to 6,100 BOE/d for the full year, which represent declines versus its fourth-quarter average daily rate of 5,900 BOE/d. That forecast suggests to investors that the company just doesn't have the resources to thrive in this current environment of low commodity prices. Finally, Resolute Energy slumped this week following its recent decision to spend $160 million on more drillable land in the Permian Basin. The company paid about $35,000 per acre for the land, which isn't unreasonable considering where Permian acreage is trading these days. However, the market didn't seem thrilled with the company's decision to use short-term debt to finance the deal, which could come back to bite it if oil prices continue to head lower because that could make it more expensive for the company to find longer-term financing. Crude prices crashing is causing investors to flee riskier energy stocks. That said, some of these sell-offs appear to be overdone. Frack sand producers have been absolutely crushed recently despite the fact that demand is improving. Because of that, an analyst at Jefferies went out on a limb and upgraded Fairmount Santrol Holdings to a buy following its sell-off, which the analyst thought was an overreaction. That bullish vote of confidence certainly makes the stock worth a closer look for investors seeking a longer-term play on the oil market recovery.